Seeds of the legume plant Lathyrus sativus, which is grown in arid and semi arid tropical regions, contain Diamino Propionic acid (DAP). DAP is a neurotoxin, which, when consumed, causes a disease called Lathyrism. Lathryrism may manifest as Neurolathyrism or Osteolathyrism, in which the nervous system, and bone formation respectively, are affected. DAP ammonia lyase is produced by a few microorganisms such as Salmonella typhi, Salmonella typhimurium and Pseudomonas, and is capable of detoxifying DAP. S. typhimurium PU011, a non-virulent bacterial strain isolated in our lab, was found to produce DAP ammonia lyase enzyme when grown in minimal medium containing DAP. There was a direct correlation between biomass yield and enzyme activity, until 16 h post inoculation in minimal medium containing DAP. Following ammonium sulphate precipitation and passing through Sephadex G100, CM-Sephadex and DEAE-Sephacel for crude enzyme extract preparation, about 68-fold enzyme purity was obtained. The purified enzyme gave maximum activity at pH 8.0 and was stable up to 45 degrees C. The Km value for the substrate was found to be 0.685mM, calculated from a Line Weaver Burk plot. A new bacterial strain, S.typhimurium PU 011, which is capable of producing DAP ammonia lyase, was isolated. Lathyrus sativus, belonging to the family of leguminoceae, is a popular drought resistant legume plant whose grains serve as food in the drought prone areas of Asia and Africa. The 2,3 α-β-Diamino propionic acid (DAP) present in L. sativus seeds when consumed causes Lathyrism in humans, affecting either the nervous system (Neurolathyrism) or bone formation (Osteolathyrism), . Medical scientists evince keen interest in understanding the causes of neurolathyrism as a model for neurodegenerative diseases striking the more affluent sections of the human population. The scourge of neurolathyrism, known since ancient times, mainly affects the poor rural classes in developing countries. Though different methods such as boiling in water and development of DAP free cultivars , had been tried, as yet no effective method has been developed for safe consumption by the famine hit, poverty ridden, malnourished hungry millions in the drought prone areas in central India and Africa. Rajagopal et al. (1970)  have studied the metabolism of DAP in Pseudomonas and demonstrated that it is metabolized to pyruvic acid through Ammonia lyase reaction. Very scant information is available on the physicochemical and catalytic properties of diamino propionic acid ammonia lyase. In this communication we report the production of DAP ammonia lyase by S. typhimurium PU011 and describe a few of its properties. The results of virulence assay performed in mice employing S. typhimurium PU011 strain are shown in Table 1. To be absolutely certain that enough number of virulent S. typhimurium and S. typhimurium PU011 are present in the mice after oral administration, to bring about mortality, each of the Salmonella strain at 2.5 × 106 CFU per mouse, which is approximately twice the reported 50% Lethal Dose (LD50) [4, 5] was employed. In the light of observations reported by Leung et al (1991) that the administration of S. typhimurium in mice resulted in death within 28 days, the experiment was continued up to 28 days post inoculation. The mice administered with virulent S. typhimurium died on 8th and 9th day of post inoculation. However, the mice administered with S. typhimurium PU011 survived even after 28 days. Further, the mice injected with virulent S. typhimurium showed the clinical symptom of diarrohea prior to death, which was conspicuously absent in mice that were inoculated with S. typhimurium PU011. The clinical examination of sacrificed mice injected with virulent S. typhimurium revealed typical symptoms of enlarged, inflamed and edematous liver and spleen, which were absent in mice, injected with S. typhimurium PU011 strain. Conclusively this is evident enough to show that S. typhimurium PU011 strain employed in our studies is a non-virulent strain. To the best of our knowledge this is the first report about the production of DAP ammonia lyase by a non-virulent S. typhimurium with wider ramifications. Vijayalakshmi (1975)  and Nagasawa (1988)  have identified Pseudomonad and Salmonella typhimurium respectively capable of producing DAP ammonia lyase that degrades the neurotoxin present in L. sativus seeds. We have accidentally stumbled upon a non-virulent bacterium S. typhimurium PU011 which was capable of producing DAP ammonia lyase. 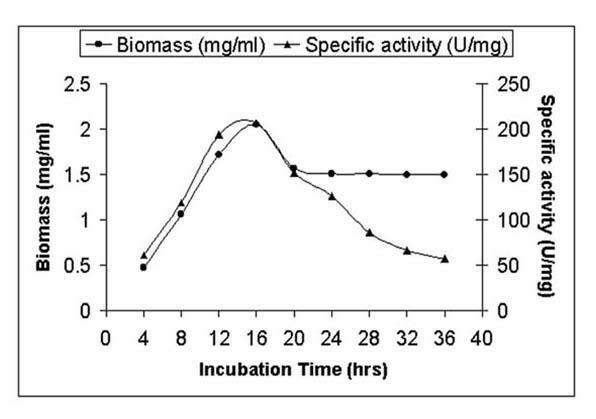 The kinetics of production of biomass and DAP ammonia lyase activity by this organism is shown in Fig 1. A continuous increase in biomass and specific activity of enzyme with increase in incubation period was observed, the maximum reaching at 16 h post inoculation. Interestingly, a direct correlation between biomass yield and enzyme activity up to 20 h after inoculation was observed. Nagasawa et al. (1988) have also observed a similar pattern of growth and enzyme activity in S. typhimurium. Biomass and DAP ammonia lyase production in Salmonella typhimurium PU 011. The culture was incubated on a rotary shaker at room temperature. The biomass was estimated gravimetrically and expressed as mg/ml. The crude enzyme activity of the culture drawn at different intervals of growth was measured spectrophotometrically and expressed as (U/mg) × 10-3. As to whether any carbon source other than DAP in the growth medium could support growth and enzyme production, it was observed that none other than DAP could substitute any of the carbon sources (data not shown). Since S. typhimurium PU011 employed in the present study was found to synthesize DAP ammonia lyase, it was thought fit to employ this enzyme for detoxification of DAP present in L. sativus seeds prior to consumption. Therefore, the characteristics of this enzyme were studied in detail. The Km value for the substrate, DL-DAP, was found to be 0.685 mM based on the Line weaver Burk plot (Fig 2). However, for the same enzyme from Pseudomonas sp. and S. typhimurium, Vijiyalakhsmi et al (1975)  and Nagasawa et al (1988)  have reported Km values at 0.267 mM and 0.12 mM respectively. The differences in Km values were attributed to D or L or DL forms of DAP used as substrate in the estimation of enzyme activity. Determination of Km value for the enzyme Diamino propionic acid ammonia lyase. 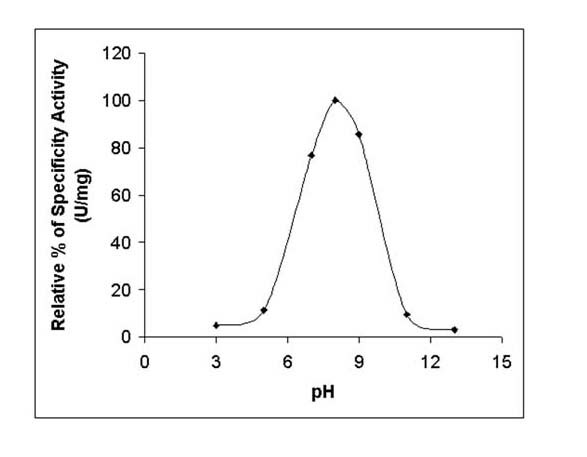 With regard to specific activity of DAP ammonia lyase in different buffer systems at various pH regimes, it was found that the enzyme had a sharp pH optimum of 8.0 in phosphate buffer and at any pH less than 6 or more than 11 a drastic reduction in activity was observed (Fig 3). Vijiyalakhsmi et al. (1975)  also have observed an optimum pH of 8.0 for maximum DAP ammonia lyase enzyme activity produced by Pseudomonas. However, in their studies Tris HCl buffer at pH 8.0 was found to inhibit 50% of enzyme activity. Effect of pH on the Stability of DAP ammonia lyase. The crude enzyme extract was incubated in 10 mM phosphate buffer at different pH regimes and the enzyme activity measured. The enzyme activity is expressed as (U/mg) × 10-3. The enzyme activity was measured using spectrophotometer at temperatures ranging between 30°C – 60°C at increment of 5°C. Up to 45°C there was no decrease in enzyme activity; however, thereafter a decline in enzyme activity with increase in temperature was observed (Fig 4). The loss in DAP ammonia lyase enzyme activity with increase in temperature indicates the level of stability of the enzyme per se to different temperature regimes and not temperature activity relationship since the enzyme was not incubated along with the substrate. While 45°C was found to support maximum enzyme activity in Salmonella sp. (Nagasawa et al., 1988) , 40°C was found to support maximum activity in Pseudomonas (Vijiyalakshmi et al., 1975). The fact that maximum activity was scored at above ambient temperature is a good augury for the use of this enzyme in the field scale applications for detoxification of DAP in L. sativus in drought prone areas of the world where elevated temperatures and desiccation pose threats for inactivation of enzyme activity. Effect of Temperature on the Stability of DAP ammonia lyase. 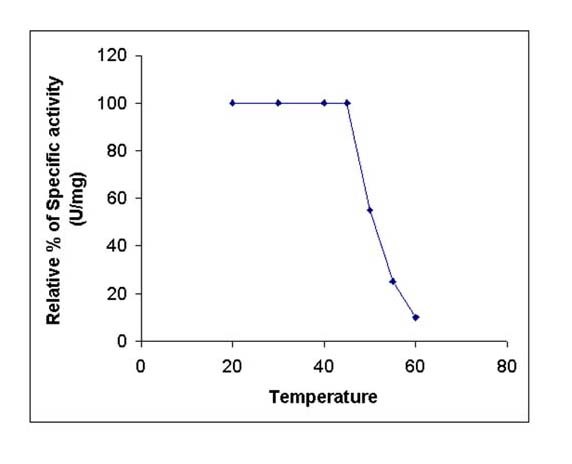 The crude enzyme extract was incubated at various temperatures ranging between 20°C – 60°C in 10 mM phosphate buffer and the enzyme activity measured. The enzyme activity is expressed as (U/mg) × 10-3. According to the procedure described in the text, the enzyme was purified 68 fold (Table 2). 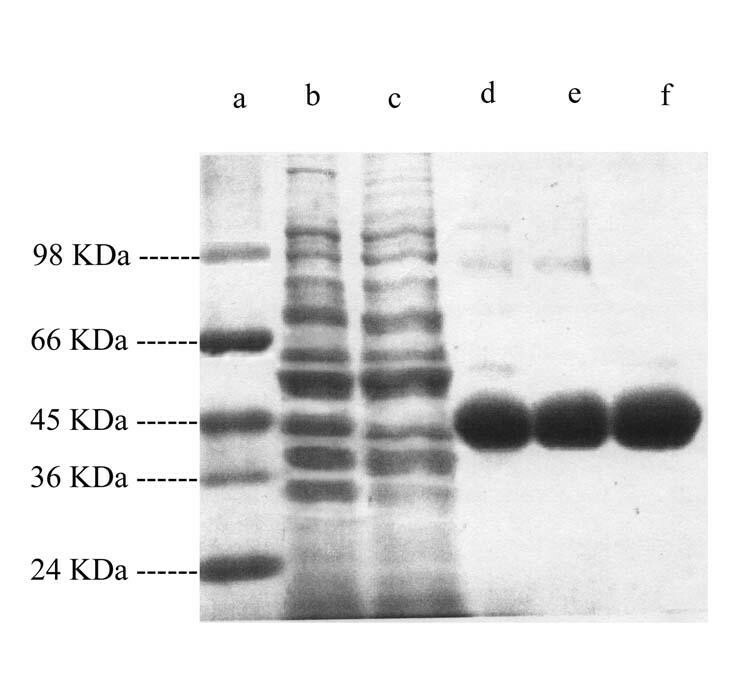 When the purified enzyme was subjected to SDS-PAGE, a single band was observed corresponding to the molecular weight of 43 KDa (Fig 5). This is in conformity with the results of Vijiyalakshmi (1975) . However, Nagasawa et al (1988)  reported that the relative molecular mass of DAP ammonia lyase produced by Salmonella typhimurium, estimated by ultra centrifugal equilibrium method, was 89,000 Da and the enzyme consisted of 2 subunits identical in Molecular mass. SDS-PAGE analysis of DAP ammonia lyase produced by Salmonella typhimurium PU 011. The crude enzyme was purified and run on SDS-PAGE. Molecular weight marker (Lane a), Crude Enzyme Extract (Lane b), Enzyme obtained after passing through Ammonium Sulfate precipitation (Lane c), Sephadex G-100 (Lane d), CM-Sephadex (Lane e) and CM-Sephacel (Lane f). The discovery of non-virulent S. typhimurium PU011 capable of producing DAP ammonia lyase has opened new vistas in the application of this enzyme in the tribal tracts of arid and semi-arid regions of Central India. For commercial exploitation of this enzyme, attempts are underway to clone and overexpress the gene coding for DAP ammonia lyase for applicative purposes in field. At 16 h post inoculation S. typhimurium PU011 produced maximum biomass yield and maximum enzyme activity in minimal medium containing DAP. Interestingly no carbon source other than DAP supported DAP ammonia lyase synthesis in the medium effectively. With respect to specific enzyme activity of DAP ammonia lyase at different pH regimes, the enzyme had a sharp activity at pH 8.0 in phosphate buffer and at any pH less than 6 or more than 11 a drastic decrease in enzyme activity was observed. Up to 45°C there was no decrease in enzyme activity; however, thereafter there was decline in enzyme activity with increase in temperature. Based on SDS-PAGE analysis of the DAP ammonia lyase enzyme, the molecular weight was determined to be 43 KDa having a Km value of 0.685 mM. Salmonella typhimurium PU011 employed in the present study was isolated in our lab and further characterized by standard microbiological, serological and biochemical tests . Cells were grown at 30°C in minimal medium (0.05% Yeast Extract, 500 μl Mineral salt solution and 2.0% Agar) supplemented with DL – DAP (0.3%) for production of DAP ammonia lyase by the bacterium. Virulent S. typhimurium (obtained from the Department of Microbiology, Jawaharlal Institute of Post Graduate Medical Education and Research (JIPMER), Pondicherry, India) and S. typhimurium PU011 suspensions were grown at 37C in LB broth overnight, with shaking at 200 rpm. The next day, bacteria were diluted 1:100 into fresh LB broth and incubated with shaking. After 4 h, bacteria were washed once with PBS and resuspended in PBS. BALB/c female mice, aged 6–10 weeks, were inoculated orally with bacterial suspensions at 2.5 × 106 CFU per mouse, which is approximately twice the reported 50% Lethal Dose (LD50) , after being deprived of water for 4 h. Control mice were given PBS only. The liver and spleen of experimental mice that died on different days after administration of S. typhimurium were harvested, homogenized and the resultant slurry was spread on Mac Conkey plates to obtain bacterial counts. After sacrifice, the mice were critically examined for the presence of typical symptoms of enlarged, inflamed and edematous liver and spleen. Mice surviving after 28 days post inoculation were indicative of the non-virulence nature of S. typhimurium employed. Cells were grown in minimal medium supplemented with 0.3% DAP at 30°C on a rotary shaker (180 rpm) as per the method outlined by Premkumar  and Rupesh . For estimation of biomass, at various intervals of time 10 ml of culture was withdrawn, centrifuged at 8000 g for 10 min, washed once with distilled water, dried at 105°C and weighed. However, for estimation of enzyme activity 25 ml of culture was withdrawn, centrifuged at 8000 g for 10 min at 4°C, suspended in 0.5 ml of extraction buffer (10 mM Potassium phosphate buffer pH 8.0, 1 mM EDTA, 1 mM β – Mercaptoethanol, 100 μM Pyridoxal-5-Phosphate and 5% Glycerol) and sonicated for 10 min using Branson Sonifier 250 (10 min bursts at 40% duty cycle with intermittent cooling every 2 min in order to maintain the suspension below 5°C). After sonication, the lysate was centrifuged at 12,000 g for 10 min at 4°C and the supernatant served as the crude extract for the estimation of enzyme activity. The DAP ammonia lyase activity was measured as per the method of Vijiyalakhsmi et al . Protein estimation was done as per the method of Lowry et al . DAP ammonia lyase was assayed spectrophotometrically, using a coupled assay system, utilizing the following reaction. The reduction in absorbance at 340 nm was measured in Hitachi U-2000 spectrophotometer. The assay system contained in a total volume of 3.0 ml in a 1 cm light path cuvette: 1 mmol Potassium phosphate buffer pH 8.0, 20 mmol DL-DAP, 0.3 μmol PLP, 15 Units of LDH, 1 μmol NADH and appropriate amount of enzyme. The reaction was studied at 28°C, and was started by the addition of DAP. The decrease in absorbance was recorded at 30 s intervals for a period of 2 min. One Unit of enzyme was defined as the amount of enzyme required for the conversion of 1 μmol of NADH to NAD+ in one minute. Specific activity is defined as Units per mg of protein. Optimum pH at which a maximum specific activity of DAP ammonia lyase could be obtained was determined by employing different buffer systems at various pH as indicated in parenthesis. The buffer systems employed were: Glycine-HCl buffer (pH 3), Sodium acetate buffer (pH 5), Potassium phosphate buffer (pH 7), Potassium phosphate buffer (pH 8), Glycine-NaOH (pH 9), Glycine-NaOH (pH 11) and KCl-NaOH (pH 13). The crude enzyme extract was taken and incubated with the above buffers for 30 min. After incubation, the crude extract was precipitated with ammonium sulfate (80% saturation) and the precipitate was resuspended in minimal volume of 10 mM potassium phosphate buffer. The effect of pH was studied by measuring DAP ammonia lyase activity as per the procedure described earlier. The crude enzyme extract in 10 mM Potassium phosphate buffer pH 8.0 was incubated at various temperatures ranging from 0°C – 70°C. After 30 min of incubation, the crude extract was analyzed for DAP ammonia lyase activity. Cell free crude extract of S. typhimurium PU011 was prepared by sonicating the pellet in 0.5 ml extraction buffer for 10 min using Branson Sonifier 250. The sonicate was then centrifuged at 12,000 g for 10 min at 4°C and the supernatant served as the crude enzyme extract. The enzyme was precipitated by addition of appropriate amounts of ammonium sulfate (35–65% saturation) as per the method of Nagasawa et al, (1988) . The precipitate was collected by centrifugation and dissolved in 1 ml of extraction buffer and dialyzed against the same buffer for 24 h.
The crude enzyme preparation was subjected to gel filtration on sephadex G-100 (1.6 × 20 cm) column chromatography. The dialyzed enzyme solution was applied to sephadex G-100 column, which had been equilibrated with 10 mM phosphate buffer. The active fractions that showed absorption at 280 nm were collected separately and DAP ammonia lyase in each fraction was quantified. The fractions that showed maximum enzyme activity were pooled and passed through CM-Sephadex column. Chromatography on CM-Sephadex column was performed on column (2 × 12.5 cm) of the resin equilibrated with 10 mM phosphate buffer pH 8.0, 1 mM β-mercaptoethanol and 1 mM pyridoxal-5-phosphate. The unbound fraction containing DAP ammonia lyase activity was reloaded onto DEAE-Sephacel column. 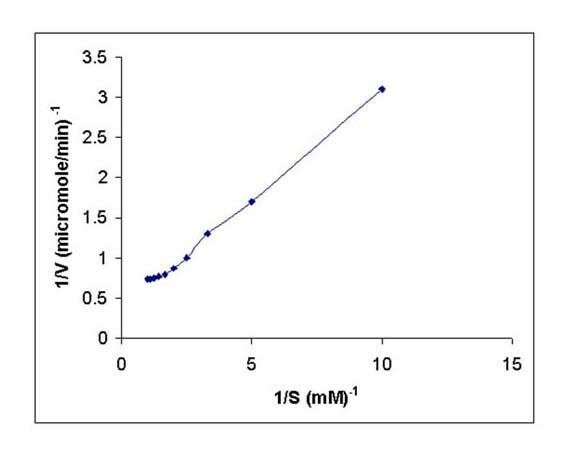 The active enzyme fraction was applied to a DEAE-Sephacel column (2 × 20 cm), which had been equilibrated with 10 mM phosphate buffer pH 8.0, 1 mM β-mercaptoethanol and 1 mM pyridoxal-5-phosphate. The enzyme fractions were eluted using 0 – 1 M KCl gradient. All the column chromatography purifications were carried out in BIORAD Econo system. The active fractions were precipitated with 80% ammonium sulfate. The precipitate was resuspended in a minimum amount of 10 mM phosphate buffer and dialyzed against the same buffer for 24 h with three changes under continuous stirring at 4°C. The progress of purification of DAP ammonia lyase was monitored both by enzyme activity measurement and on 12% SDS-PAGE. Routinely 0.75 mm thick gels were cast in a protein gel apparatus using a separating gel (12 %) and stacking gel (5%). The separating gel solution was first poured in between a sealed clean glass plate cassette leaving 3 to 4 cm space at the top. Water saturated n-butanol was layered gently on the top of the separating gel to make an even surface. After the separating gel got polymerized, the upper layer was removed completely and rinsed with water. Water was removed completely using a blotting paper. Stacking gel solution was poured onto the separating gel up to the top. A suitable comb was immediately inserted into the cassette and polymerization was allowed to take place. The slots were cleaned by rinsing with electrophoresis buffer. Protein samples were loaded into the slots and the slots were filled with 1 × electrophoresis buffer. The gel cassette was then fixed with the upper buffer tank and then fixed onto the lower buffer tank. Both the tanks were filled with 1 × electrophoresis buffer and electrophoresis was carried out at a constant current of 15 mA. After electrophoresis was over, the gel cassette was dismantled and the gel was placed in a tray containing Coomassiae Brilliant Blue staining solution (0.1 % Coomassie Brilliant Blue (R 250), 45 % Methanol, 10 % Glacial Acetic Acid and 45 % Distilled water) and the gel was agitated slowly for 4 h to overnight. The staining solution was poured out and replaced with destaining solution (45 % Methanol, 10 % Glacial Acetic Acid and 45 % Distilled water). Destaining was carried out for a minimum of 2 h with gentle agitation. The assistance rendered by M. K. Natarajan, JIPMER, Pondicherry, India in carrying out the microbiology work is gratefully acknowledged.